Notoriously fickle, golfers rarely agree, be it green speeds, rough or where to get the best steak. So you know it was extraordinary stuff at THE PLAYERS Championship 2003 to get a consensus about Davis Love III’s historic win. “Best round of golf I’ve ever seen played,” said Fred Couples, who was alongside Love’s dynamic, fourth-round 8-under 64 in cold, biting winds. Consider Couples’ perspective. 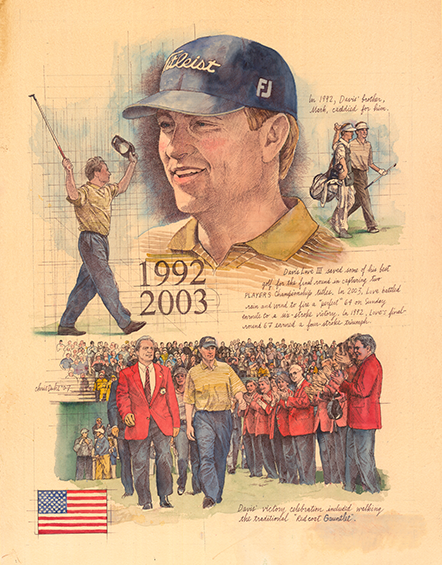 He had shot a fourth-round 64 to win THE PLAYERS in 1996. But Love had far tougher conditions, so Couples gave him the nod. Competitors and fans weren’t about to offer a dissenting opinion. Nor was Love. Erasing a two-stroke deficit and finishing at 17-under 271 to win by six over Jay Haas and Padraig Harrington, Love had an early birdie, then five in a row starting at the par-3 eighth. Then he sealed the deal at THE PLAYERS Stadium Course at TPC Sawgrass with a 6-iron off of pine straw to eagle the treacherous, par-5 16th. Bold, though Love was determined to answer critics who felt he had underachieved, despite 15 wins. So, while there was quantity — a $1,170,000 prize — Love embraced quality —golf’s best field and purest test in the 30th anniversary of the showcase event on the PGA TOUR. “One of the biggest days of my career, because I certainly didn’t need another near miss,” said Love, the fifth to win THE PLAYERS twice. Near miss? He was near perfect.